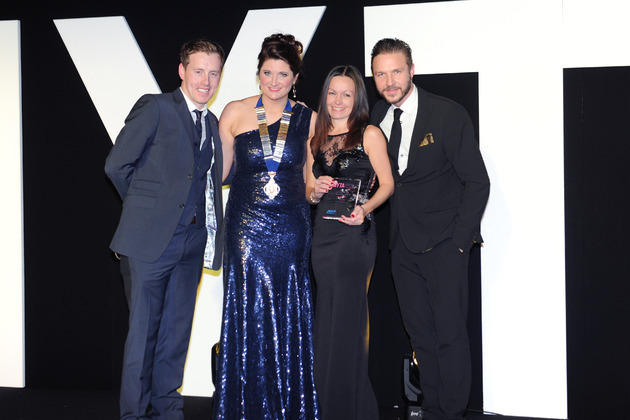 Four Recruitment – the North West based specialist recruitment company is celebrating after one of their senior consultants – Gemma Sofield won ‘The Best Talent and Recruiter’ award at the Manchester Young Talent Awards held last week at the Midland Hotel in Manchester. Gemma beat competition from companies including: We are Adam, SJC Partners and Michael Page. The judges were extremely impressed with that at the age of just 28 Gemma established Four HR — part of Four Recruitment established by her brother and sister Phil & Claire. Gemma’s previous experience had been in a HR role, as a CIPD qualified HR professional. It was after supporting Four with their own HR needs, that Gemma saw a niche in the market for a specific HR recruitment consultancy, and using her HR background and knowledge she launched Four HR in 2013. Since its inception Four HR has become the fastest growing division in the Four Recruitment family. In the last financial year alone Gemma`s division has contributed to 16% of Four Recruitment’s annual revenue – which as its first full year of trading is quite an achievement. Without doubt Gemma`s in depth knowledge of HR has given her a huge head start in launching this business and has helped her assist her clients with some really niche roles requiring very specialised backgrounds. This has exposed what looks to be have been a real gap in the North West market for the more specialised HR Recruiter to assist with roles requiring a much more in-depth knowledge of the backgrounds and personalities required. Four HR is also a great partner to Four’s other brands – Four Financial and Four Practice. It gives Gemma and the team direct contacts with those directly responsible for recruitment in many of the regions leading companies.